Emphasizing integrated access control solutions in booth #8037 at the ISC West exhibition in Las Vegas, NV from April 11-13. Boon Edam Inc., a global leader in security entrances and architectural revolving doors, today announced it will emphasize integrated access control solutions in booth #8037 at the ISC West exhibition in Las Vegas, NV from April 11-13. ISC West is the largest security trade show in the United States, bringing together over 30,000 security professionals for its 3-day event. Boon Edam is also the official turnstile sponsor at the exhibition. Lifeline Speedlane Swing: The industry’s slimmest optical turnstile will feature a custom, integrated pedestal that incorporates the MorphoWave™ touchless fingerprint technology from IDEMIA. This solution enables high throughput with the enhanced security of rapid biometric identification, all in a stylish, cohesive design. Circlelock 200: Offering the highest level of security available in an entrance, the Circlelock security portal prevents intrusion into the most sensitive areas such as data centers. The portal will be configured to demonstrate two-factor authentication: an AMAG Symmetry card reader on the outside of the portal conducts the initial authorization, followed by an iris scanning technology inside the portal from Iris ID called the iCAM7S Series reader, to confirm identity. Circlelock Half Portal: The Circlelock half portal is the newest entry solution by Boon Edam. This clever solution transforms an existing swinging door into a high security mantrap entrance that prevents piggybacking. It also enables organizations to save on both space and renovation costs. In the booth, the half portal will demonstrate a two-factor authentication scenario: initial authentication using an AMAG Symmetry card reader to enter the portal, followed by facial scanning technology from StoneLock Pro® to open the second door. Tourlock 180+90: The industry’s best-selling security revolving door will feature an AMAG Symmetry card reader to demonstrate access control integration paired with the door’s uniquely high, bi-directional throughput and its ability to prevent tailgating and piggybacking without manned supervision. StereoVision 2®: A proprietary technology in Boon Edam’s Circlelock and Tourlock, StereoVision 2 prevents piggybacking by using a combination of near infrared and optical sensors to determine if someone is entering the door alone. Visitors to the booth will be able to see how they can calibrate the technology to obtain the mathematical probability of successful piggybacking prevention, thereby justifying their investment in high security doors and portals. 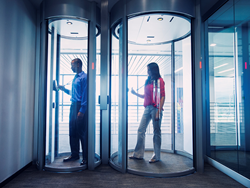 BoonConnect: An IP-addressable, proprietary software system provides diagnostic and configuration tools for the Tourlock security revolving door and Circlelock mantrap portal. Users can remotely access door operations and events using devices such as a tablet, laptop or smartphone via a secured corporate network. BoonTouch: A proprietary desktop control panel with integrated software for efficient traffic management of many of Boon Edam’s security entrances. For the 11th year in a row, Boon Edam is the official turnstile sponsor of ISC West. For the first time, the company is excited to install 34 lanes of a new optical turnstile at the show entrances: the Speedlane Open, which features a barrier-free design ideal for deterring casual tailgating attempts. The Open turnstile is part of the sleek and modern Lifeline Series launched in 2015, which has helped propel Boon Edam to the market leading position for security entrances, according to “Pedestrian Entrance Control Equipment” by IHS Markit® for the 2014-2016 period.